A spectator on the National Mall holds an image of President Obama and Martin Luther King during the 2013 presidential inauguration in January. Obama doesn't often talk publicly about race. But it's clearly a subject he's thought and written a lot about. So when an African-American professor asked the president last week during a college visit in New York, where does he think the country is in terms of civil rights, Obama's answer was complicated. "Obviously, we've made enormous strides," said Obama. "I'm a testament to it. You're a testament to it." At the same time, Obama said, discrimination has not disappeared. And while it's nothing like it was 50 years ago, the legacy of Jim Crow has left lasting barriers to success. "There are a lot of folks who are poor and whose families have become dysfunctional because of a long legacy of poverty, and live in neighborhoods that are run down and schools that are underfunded," he said. After the Trayvon Martin verdict last month, Obama spoke in personal terms about the experience of being profiled as a black man in America. His remarks were praised in some quarters, but criticized in others. "I don't think that the racial climate in this country is helped when the president wades in to what are always turbulent racial waters and stirs things up, which is what he did," says Abigail Thernstrom, a member of the U.S. Commission on Civil Rights, who was appointed by President George W. Bush. Democratic pollster Cornell Belcher disagrees, saying resistance to frank talk about race is one reason the country hasn't made more progress. "It's a conversation that makes a lot of white America uncomfortable and they would rather not have," says Belcher. "And understand, they have not had to have the conversation." Obama has also not shied away from tough conversations about problems within the African-American community, where he says too many young men continue to make bad choices. He told graduates of Morehouse College in May there's no longer any room for excuses: "Nobody cares how tough your upbringing was. Nobody cares if you suffered some discrimination. And moreover, you have to remember that whatever you've gone through, it pales in comparison to the hardships previous generations endured. And they overcame them. And if they overcame them, you can overcome them, too." On Wednesday, Obama is likely to talk about civil rights in broader terms, encompassing not just blacks and whites but Latinos, women and gays, much as he did in his second inaugural, when he spoke in one breath of Selma, Stonewall, and Seneca Falls — the touchstone battlegrounds for all these civil rights movements. Obama likes to quote King's comment that all of us are "tied in a single garment of destiny." But he's also warned in recent weeks that because of persistent economic anxiety, that unifying fabric is in danger of unraveling. "Because times have been tough, because wages and incomes for everybody have not been going up, everybody is pretty anxious about what's happening in their lives and what might happen for their kids, and so they get worried that, well, if we're helping people in poverty, that must be hurting me somehow. It's taking something away from me." Obama told that college professor in New York last week "it's in all of our interests" to lift up poor communities and help young people succeed — delivering on that promissory note that King talked about 50 years ago. On Wednesday, the president is expected to leave his audience with the challenge of renewing that promise. It's MORNING EDITION, from NPR News. Good morning. I'm Renee Montagne. An historic moment in the nation's capitol today: President Obama will stand in the symbolic shadows of Martin Luther King and Abraham Lincoln as he marks the 50th anniversary of the March on Washington. Aides say the president will use the opportunity to celebrate progress that's been made and discuss the work he says still must be done to realize Dr. King's dream of racial justice. Here's NPR White House correspondent Scott Horsley. SCOTT HORSLEY, BYLINE: President Obama doesn't often talk publicly about race. But it's clearly a subject he's thought and written a lot about. So when an African-American professor asked the president last week during a college visit in New York where does he think we are in terms of civil rights, Obama's answer was complicated. PRESIDENT BARACK OBAMA: Obviously, we've made enormous strides. I'm a testament to it. You're a testament to it. HORSLEY: At the same time, Obama said, discrimination has not disappeared. And while it's nothing like it was 50 years ago, he says the legacy of Jim Crow has left lasting barriers to success. OBAMA: There are a lot of folks who are poor, and whose families have become dysfunctional because of a long legacy of poverty, and live in neighborhoods that are run down and schools that are underfunded. HORSLEY: After the Trayvon Martin verdict last month, Obama also spoke in personal terms about the experience of being profiled as a black man in America. His remarks were praised in some quarters, but criticized in others. Abigail Thernstrom is a George W. Bush appointee to the U.S. Commission on Civil Rights. ABIGAIL THERNSTROM: I don't think that the racial climate in this country is helped when the president wades in to what are always turbulent racial waters and stirs things up, which is what he did. HORSLEY: Democratic pollster Cornell Belcher disagrees, saying resistance to frank talk about race is one reason the country hasn't made more progress. CORNELL BELCHER: It's a conversation that makes a lot of white America uncomfortable, that they would rather not have. And understand, they have not had to have the conversation. HORSLEY: Obama has also not shied away from tough conversations about problems within the African-American community, where he says too many young men continue to make bad choices. He told graduates of Morehouse College in May: There's no longer any room for excuses. OBAMA: Nobody cares how tough your upbringing was. Nobody cares if you suffered some discrimination. And moreover, you have to remember that whatever you've gone through, it pales in comparison to the hardships previous generations endured, and they overcame them. And if they overcame them, you can overcome them, too. 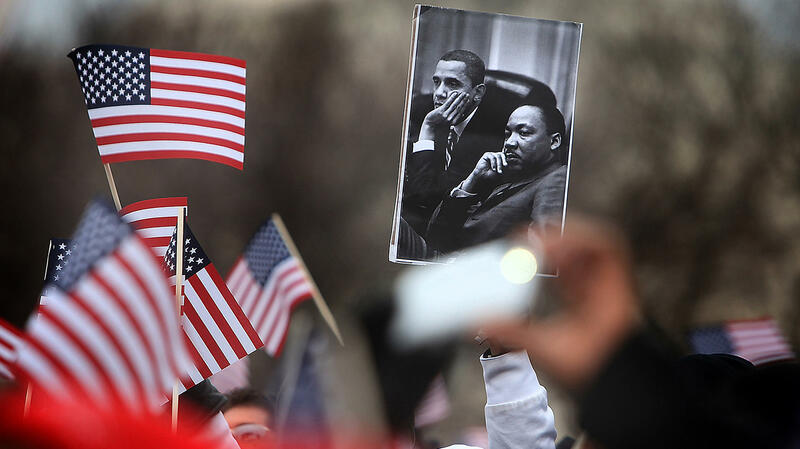 HORSLEY: Today, Obama is likely to talk about civil rights in broader terms, encompassing not just blacks and whites, but Latinos, women and gays, much as he did in his second inaugural, when he spoke in one breath of Selma, Stonewall and Seneca Falls. Obama likes to quote Dr. King's comment that all of us are "tied in a single garment of destiny." But he's also warned in recent weeks that because of persistent economic anxiety, that unifying fabric is in danger of unraveling. OBAMA: Everybody's pretty anxious about what's happening in their lives and what might happen for their kids, and so that they get worried that, well, if we're helping people in poverty, that must be hurting me somehow. It's taking something away from me. HORSLEY: Obama told that college professor in New York last week: It's in all of our interests to lift up poor communities and help young people succeed, delivering on that promissory note Dr. King talked about 50 years ago. Scott Horsley, NPR News, Washington. Transcript provided by NPR, Copyright NPR. 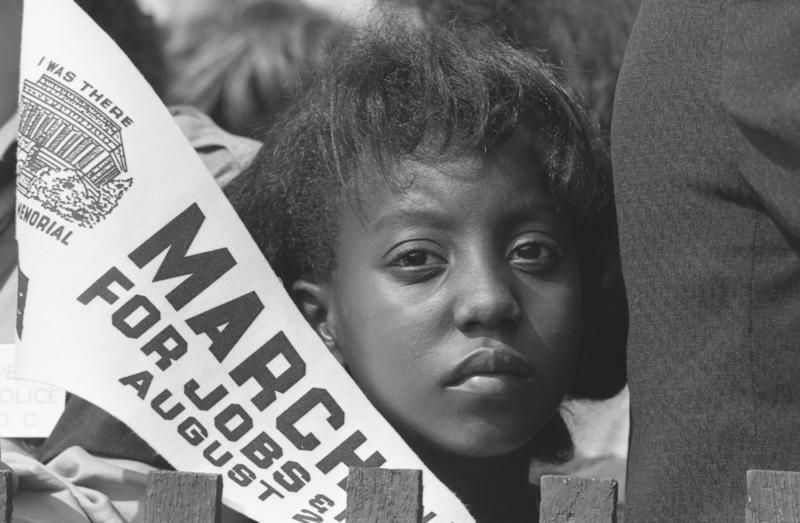 For the month of August, Morning Edition and The Race Card Project are looking back at a seminal moment in civil rights history: the March on Washington for Jobs and Freedom, where the Rev. Martin Luther King Jr. delivered his iconic "I Have a Dream Speech" on Aug. 28, 1963. Approximately 250,000 people descended on the nation's capital from all over the country for the mass demonstration.